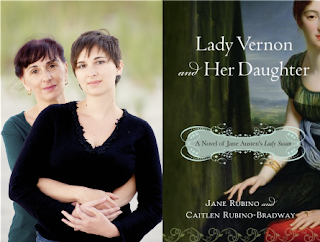 One of the most charming reads of my 2009 was Lady Vernon and Her Daughter by the mother-daughter team, Jane Rubino and Caitlen Rubino-Bradway. A bit different from all of the Jane Austen spin-offs that have been beseiging the book stores, Lady Vernon is a re-telling of Austen's novella, Lady Susan. Light and engaging, Lady Vernon will appeal to not only all Jane Austen fans, but to all readers. What was it about Jane Austen’s epistolary novel, Lady Susan that inspired you to write Lady Vernon and Her Daughter? Jane: Writing Lady Vernon and Her Daughter began when I (Jane) began to think about writing a historical mystery. I had been reading Lady Susan at the time and thought that it had plot elements that might be adapted to a mystery-oriented revision; then, I decided that "The Lady Susan Mysteries" would not do justice to the work, and asked Cait if she would like to co-write a historical, using the material in Lady Susan; a few chapters into the writing, we decided that it would work better as a pastiche - a novel written in the style of Lady Susan, adapting a novel-in-letters to a full length work, as Jane Austen had done with Elinor and Marianne (Sense and Sensibility). Caitlen: It was Mom who originally came up with the idea. She’s written a mystery series that takes place in our home town of Ocean City, NJ, and she’d been toying with the idea of starting another series at the same time that she was re-reading Lady Susan. It seemed like a lot of elements in Lady Susan would be fun in a mystery series — there's the beautiful schemer, the three men vying for her attention, the young ingénue, the gossipy friend in London, the first husband’s mysterious death. The idea eventually evolved into a Jane Austen style mystery, and Mom asked me to come on board After the first couple drafts, we decided we wanted to make it a straight Austen homage, but there was, actually, a murder mystery element in it up until the last couple revisions. Jane – was it a big stretch to write Lady Vernon after writing mysteries? Not really. In Pride and Prejudice, Elizabeth Bennet observes that one man (Darcy) has all the goodness and the other (Wickham) has all the appearance of it. That theme of disguise and revelation is at the core of every mystery - both Austen and a good mystery are founded on taking what is apparent, but not necessarily true, and working down to the fundamentals. This is Austen's approach to her villains and scoundrels - Wickham, Willoughby, Walter Elliot, Henry Crawford all present themselves one way, but are revealed to be something very different, and darker. Caitlen – have you always wanted to follow in your mother’s footsteps? Well, not since birth, but for a very long time. Mom got all of us hooked on reading at a young age — she would always read a chapter to us from a story every night before bedtime when we were little. She taught me how much fun stories can be. Plus I'm a bit of a control freak (again, thank you, Mom) so it wasn't a big leap from reading stories to wanting to make up my own. I’d like to think it’s genetic. Will you two be working on another project? If so, can you tell us a bit about it? Caitlen: We are in the early stages of another Jane Austen homage, much like Lady Vernon and Her Daughter. It’s not a sequel, but we’re taking the same approach — that of expanding and revising one of Jane Austen’s earlier works. The good thing is that we have a lot to choose from, not only are there Austen’s unfinished works, The Watsons and Sanditon, but she wrote a number of very charming pieces in her youth that have a lot of potential. Question to both Caitlen and Jane: Name a book that changed your life and tell us why. Jane: I don't think of any book as life-changing other than the Bible. But there are books that definitely influence one's desire to write - mysteries, certainly, because they present a unique challenge in designing the plot. I think the first book that really captivated me in this way was The Hound of the Baskervilles, which I read when I was about 10 years old. That book not only pulled together some compelling narrative elements - mystery, legend, adventure, the supernatural - but introduced (to me) the wonderful character of Sherlock Holmes. Beyond Doyle's Canon, anything with a good character - Scarlett O'Hara, David Copperfield, Ahab, Madame Bovary, Atticus Finch - will always challenge a writer to design characters who are not only serviceable, but memorable because characters tend to stay with us longer than the particulars of the plot. JANE RUBINO: Jane Rubino holds a BA from NYU in Dramatic Literature, Theatre and Cinema. She lives in Ocean City, New Jersey and is the author of a contemporary mystery series set at the Jersey shore, and a volume of Sherlockian novellas. She has also written several short screenplays that have been produced as student and independent films; one of the films was recently awarded a jury prize at San Francisco's annual WYSIWYG Film Festival. She and her husband of 36 years have three grown children and a number of beloved dogs. CAITLEN RUBINO-BRADWAY: Caitlen Rubino-Bradway holds a BA in English Literature and an MA in Publishing from Rosemont College. While in college, she interned with LeFrak Productions, Tor, and Jane Dystel Literary and received the Margaret Humphrey Award for Creative Writing. She was raised in Ocean City, New Jersey and now lives and works in New York City, where she is currently perfecting her recipe for peach cobbler. Yes, I agree. I read this last month and enjoyed it. I knew nothing about Austen's Lady Susan, so it was a nice treat. I won it in a give-away, so that was even more fun! Will have to check this out for our library.